A shock wave (also called shock front or simply "shock") is a type of propagating disturbance. Like an ordinary wave, it carries energy and can propagate through a medium (solid, liquid, or gas) or in some cases in the absence of a material medium, through a field such as the electromagnetic field. Shock waves are characterized by an abrupt, nearly discontinuous change in the characteristics of the medium. Across a shock, there is always an extremely rapid rise in pressure, temperature, and density of the flow. In supersonic flows, expansion is achieved through an expansion fan. A shock wave travels through most media at a higher speed than an ordinary wave. When a shock wave passes through matter, the total energy is preserved but the energy that can be extracted as work decreases and entropy increases. This, for example, creates additional drag on aircraft with shocks. Unlike solitons (another kind of nonlinear wave), the energy of a shock wave dissipates relatively quickly with distance. Also, the accompanying expansion wave approaches and eventually merges with the shock wave, partially canceling it out. Thus the sonic boom associated with the passage of a supersonic aircraft is the sound wave resulting from the degradation and merging of the shock wave and the expansion wave produced by the aircraft. Normal: At 90° (perpendicular) to the flow direction oof the shock medium. Bow: Occurs upstream of the front (bow) of a blunt object when the upstream velocity exceeds Mach 1. When an object (or disturbance) moves faster than the information about it can be propagated into the surrounding fluid, fluid near the disturbance cannot react or "get out of the way" before the disturbance arrives. In a shock wave the properties of the fluid (density, pressure, temperature, velocity, Mach number) change almost instantaneously. Measurements of the thickness of shock waves have resulted in values approximately one order of magnitude greater than the mean free path of the gas investigated. Shock waves form when the speed of a gas changes by more than the speed of sound. At the region where this occurs sound waves traveling against the flow reach a point where they cannot travel any further upstream and the pressure progressively builds in that region, and a high pressure shock wave rapidly forms. Shock waves are not conventional sound waves; a shock wave takes the form of a very sharp change in the gas properties on the order of a few mean free paths (roughly micro-meters at atmospheric conditions) in thickness. Shock waves in air are heard as a loud "crack" or "snap" noise. Over longer distances a shock wave can change from a nonlinear wave into a linear wave, degenerating into a conventional sound wave as it heats the air and loses energy. The sound wave is heard as the familiar "thud" or "thump" of a sonic boom, commonly created by the supersonic flight of aircraft. The shock wave is one of several different ways in which a gas in a supersonic flow can be compressed. Some other methods are isentropic compressions, including Prandtl-Meyer compressions. The method of compression of a gas results in different temperatures and densities for a given pressure ratio, which can be analytically calculated for a non-reacting gas. A shock wave compression results in a loss of total pressure, meaning that it is a less efficient method of compressing gases for some purposes, for instance in the intake of a scramjet. 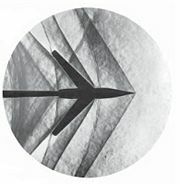 The appearance of pressure-drag on supersonic aircraft is mostly due to the effect of shock compression on the flow. Similar phenomena affect strong sound waves in gas or plasma, due to the dependence of the sound speed on temperature and pressure. Strong waves heat the medium near each pressure front, due to adiabatic compression of the air itself, so that high pressure fronts outrun the corresponding pressure troughs. While shock formation by this process does not normally happen to sound waves in Earth's atmosphere, it is thought to be one mechanism by which the solar chromosphere and corona are heated, via waves that propagate up from the solar interior. A shock wave may be described as the furthest point upstream of a moving object which "knows" about the approach of the object. In this description, the shock wave position is defined as the boundary between the zone having no information about the shock-driving event, and the zone aware of the shock-driving event, analogous with the light cone described in the theory of special relativity. To get a shock wave something has to be traveling faster than the local speed of sound. In that case some parts of the air around the aircraft are traveling at exactly the speed of sound with the aircraft, so that the sound waves leaving the aircraft pile up on each other, similar to a tailback on a road, and a shock wave forms, the pressure increases, and then spreads out sideways. Because of this amplification effect, a shock wave is very intense, more like an explosion when heard (not coincidentally, since explosions create shock waves). Shock wave propagating into a stationary medium, ahead of the fireball of an explosion. 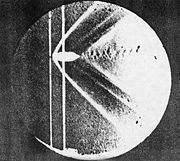 The shock is made visible by the shadow effect (Trinity explosion). It usually consists of a shockwave propagating into a stationary medium. In this case, the gas ahead of the shock is stationary (in the laboratory frame), and the gas behind the shock is supersonic in the laboratory frame. The shock propagates with a wave front which is normal (at right angles) to the direction of flow. The speed of the shock is a function of the original pressure ratio between the two bodies of gas. Examples include a balloon bursting, shock tube, and a shock wave from an explosion. A detonation wave is essentially a shock supported by a trailing exothermic reaction. It involves a wave traveling through a highly combustible or chemically unstable medium, such as an oxygen-methane mixture or a high explosive. The chemical reaction of the medium occurs following the shock wave, and the chemical energy of the reaction drives the wave forward. A detonation wave follows slightly different rules from an ordinary shock since it is driven by the chemical reaction occurring behind the shock wave front. In the simplest theory for detonations, an unsupported, self-propagating detonation wave proceeds at the Chapman-Jouguet velocity. A detonation will also cause a shock of type 1, above to propagate into the surrounding air due to the overpressure induced by the explosion. When a shockwave is created by high explosives such as TNT (which has a detonation velocity of 6,900 m/s), it will always travel at high, supersonic velocity from its point of origin. Detached shocks are curved and form a small distance in front of the body. Directly in front of the body, they stand at 90 degrees to the oncoming flow and then curve around the body. Detached shocks allow the same type of analytic calculations as for the attached shock, for the flow near the shock. They are a topic of continuing interest, because the rules governing the shock's distance ahead of the blunt body are complicated, and are a function of the body's shape. Additionally, the shock standoff distance varies drastically with the temperature for a non-ideal gas, causing large differences in the heat transfer to the thermal protection system of the vehicle. These follow the "strong-shock" solutions of the analytic equations, meaning that for some oblique shocks very close to the deflection angle limit, the downstream Mach number is subsonic. A detached shock occurs when the maximum deflection angle is exceeded. A detached shock is commonly seen on blunt bodies, but it may also be seen on sharp bodies at low Mach numbers. Examples of detached shock include space return vehicles (Apollo, Space shuttle), bullets, the boundary (Bow shock) of a magnetosphere. The name "bow shock" comes from the example of a bow wave, the detached shock formed at the bow (front) of a ship or boat moving through water, whose slow surface wave speed is easily exceeded (see ocean surface wave). These shocks appear as "attached" to the tip of a sharp body moving at supersonic speeds. The attached shock wave is a classic structure in aerodynamics because, for a perfect gas and inviscid flow field, an analytic solution is available, such that the pressure ratio, temperature ratio, angle of the wedge and the downstream Mach number can all be calculated knowing the upstream Mach number and the shock angle. Smaller shock angles are associated with higher upstream Mach numbers, and the special case where the shock wave is at 90 degrees to the oncoming flow (Normal shock), is associated with a Mach number of one. These follow the "weak-shock" solutions of the analytic equations. In this case the gas ahead of the shock is supersonic (in the laboratory frame), and the gas behind the shock system is either supersonic (oblique shocks) or subsonic (a normal shock) (although for some oblique shocks very close to the deflection angle limit, the downstream Mach number is subsonic). The shock is the result of the deceleration of the gas by a converging duct, or by the growth of the boundary layer on the wall of a parallel duct. ↑ Gary S. Settles, High-speed Imaging of Shock Wave, Explosions and Gunshots, American Scientist 94 (1): 22–31. Anderson, John D. Jr. 1984 (2001). Fundamentals of Aerodynamics, 3rd Edition. New York, NY: McGraw-Hill Science/Engineering/Math. ISBN 0072373350. Davison, Lee. 2008. Fundamentals of Shock Wave Propagation in Solids. Berlin, DE: Springer. ISBN 3540745688. Zel'dovich, Ya. B. and Yu. P. Raizer. 2002. Physics of Shock Waves and High-Temperature Hydrodynamic Phenomena. Mineola, NY: Dover Publications. ISBN 0486420027. This page was last modified on 15 September 2015, at 16:39.